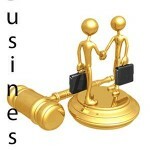 Business law, or commercial law, is the branch of civil law governing business and commerce. It provides a legal framework for creating, organizing and conducting businesses. Business law covers a wide variety of topics, including corporations, partnerships, limited partnerships, franchises, and limited liability companies. When you start a business, it is important to have a written business plan, a good understanding of the economics of the business, some experience in a related business, and enough funds to be able to cover your costs until the business becomes profitable. Before starting a business, it is often a good idea to speak to an accountant and a business lawyer, so that you understand the tax and legal issues of your venture, and the best ways to limit your personal liability. A brief, inexpensive legal consultation can save you a lot of money over the long term and short term. The legal structure of your business is extremely important. State law enables you to create a legal entity – a separate “identity” from your own person – under which you can transact business, without the risk of exposing your assets to any personal liability that might arise out of your business affairs. The form of your business entity will determine the extent of your personal liability how the business will be taxed, so it is important to obtain advice from an experienced business lawyer before you decide how to structure your new enterprise. 1. Trademarks: Register your trademark. Simply reserving a domain name does not guarantee legal rights. Since domain name registrants do not deal with trademark disputes, federal trademarks take precedence over domain registrations. 2. Investors and Partners: It is vital to document all financial understandings with cofounders, in case disputes arise at a later date. 3. Employees: Consider the legal issues involved in hiring employees. Employees have many legal rights that must not be neglected. 4. Contract liability: Establish limits of liability in contracts by limiting the maximum liability to that of the contract and by excluding consequential damages. Starting up a new business can be very exciting, but in order to ensure the future success of your venture, it is important to involve a business lawyer in the early stages of your planning.